Just a few quick lines hoping to find you fit and happy. I’m writing from the Australian Comfort Fund rooms in Tel-Aviv, being in the middle of a glorious seven days leave, seeing the sights and living like a prince in all the comfort and luxury of civilisation – sleeping on feather beds with sheets and pillows, bathing in porcelain baths and eating real food off glass topped tables with table linen, china and glassware and good Aussie beer. I’ve been to Jerusalem and Haifa and hope to be back in Jerusalem on Christmas morning. Though of course there’s nothing of the hospitality of England and Scotland it’s a wonderful break from barracks. This is really the first leave I’ve had since six day leave in England so you can imagine I’m making the best of it. 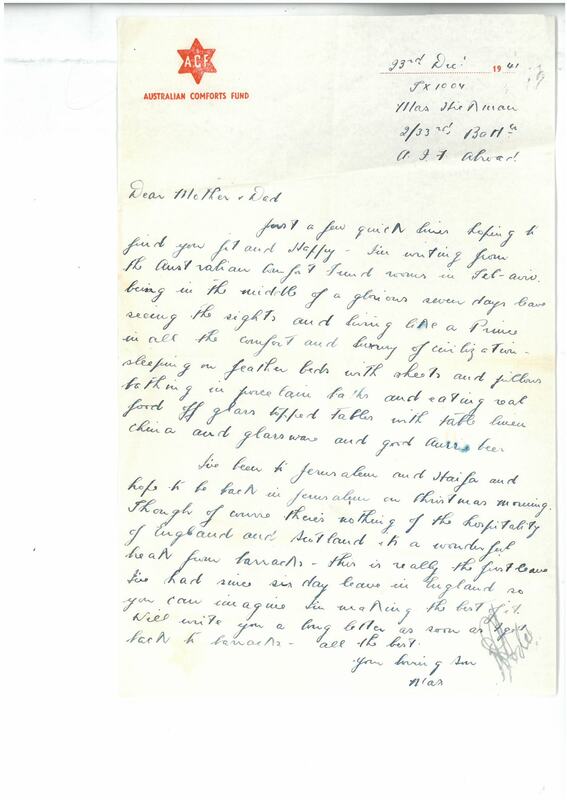 Will write you a long letter as soon a I get back to barracks – all the best. I received your welcome letter of the 8th together with Christmas cable and quite a bundle of other mail when I got back from leave this evening. They made up a very pleasant welcome indeed. As I mentioned in the short note I wrote from Tel-Aviv I had a great time. It was the first leave I’ve had for a long time and the first chance to have a look at Palestine so I made the most of it. Jerusalem is of course the most interesting place in Palestine, probably in the world and although the weather was crook it was an unforgettable experience especially at Christmas time. Although I was unable to attend the service at the Church of the Nativity at midnight on the 24th just to be there was great. On a trip a few days earlier I saw the church – the oldest Christian church in the world and the Grotto where Christ was born and a few paces away the spot marked with the Star of Bethlehem – the manger in which he was laid – both spots made very beautiful with richly inlaid work and gold candles. It is easy to picture the Grotto as the stable under the Inn. (The church is built on the site of the Inn) and to follow the whole story. The Roman Catholic chapel attached to the main church is a beautiful place. It is here that the Midnight Mass is celebrated. 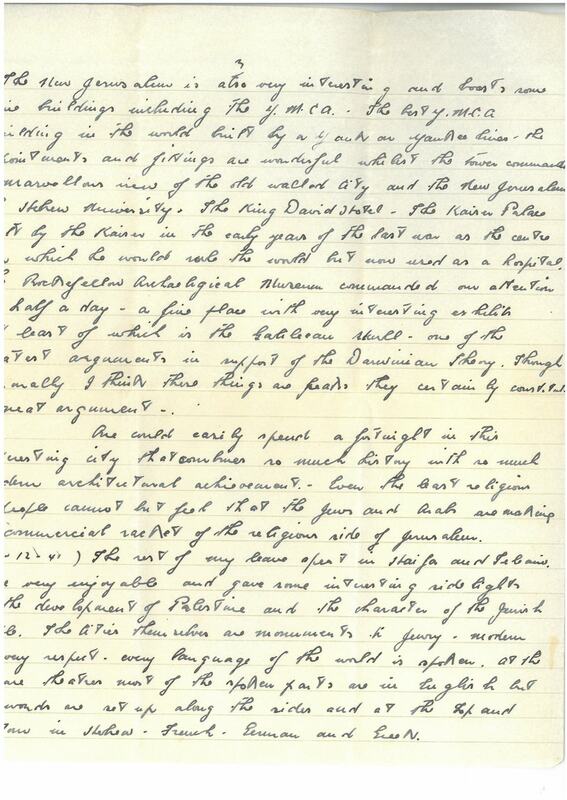 It was late in the afternoon when I got to Jerusalem and had some difficulty in getting accommodation and by the time I had done so was advised that it would be too late and as there was a real storm on, went to the YMCA and listened to the carol singing. Then at midnight we went to St Andrews Congregational Church – a very nice service too. On Christmas Day we went to the Church of the Holy Sepulchre – a wonderful place, part of it built on the site of Calvary. Most of the building is supported by immense scaffolding. From a little shop nearly I bought a mother-of-pearl Star of Bethlehem which I am sending, and some other little gifts. In the course of various tours I saw most of the religious battlements, including the Via Delorosa – where Christ carried the cross on his way to Calvary. At one spot there’s a convent built where Pontius Pilate’s house was and a plaque in the wall marks the pot where Pilate stood when he made the remark – “Behold the Man”. Another interesting place was St Anna’s church built over the cave where the Virgin Mary was born and nearby steep steps lead down to what is left of the Pool of Bethesda where Christ cured the incurable man saying – “Take up thy bed and walk”. We also went to the Mount of Olives, the Garden of Gethsemane, the Dead Sea and the Jordan Valley. On that trip the guide pointed out the Wilderness – and it certainly is a wilderness – the most barren desolate waste of rock and sand without a shrub or blade of grass, but really amazing rock phenomena – and the Mount of Temptation. The New Jerusalem is also very interesting and boasts some fine buildings including the YMCA. The best YMCA building in the world built by a Yank on Yankee lines. 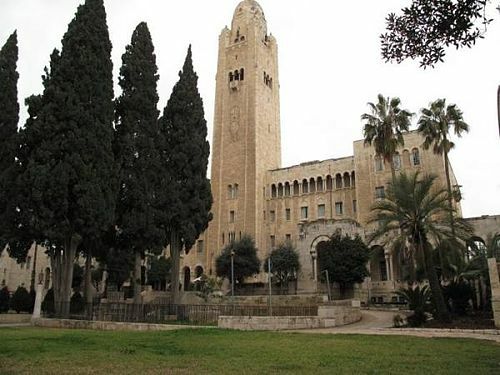 The appointments and fittings are wonderful whilst the tower commands a marvellous view of the old walled city and the New Jerusalem, the Hebrew University, the King David Hotel, the Kaiser Palace built by the Kaiser in the early years of the last war as the centre from which he would rule the world but now used as a hospital. The Rockefeller Archaeological Museum commanded our attention for half a day – a fine place with very interesting exhibits not least of which is the Galilean Skull – one of the greatest arguments in support of the Darwinian theory. Though personally I think these things are freaks they certainly constitute a great argument. One could easily spend a fortnight in this interesting city that combines so much history with so much modern architectural achievement. Even the least religious of people cannot but feel that the Hews and Arabs are making a commercial racket of the religious side of Jerusalem. The rest of my leave spent in Haifa and Tel-Aviv were very enjoyable and gave some interesting sidelights on the development of Palestine and the character of the Jewish people. The cities themselves are monuments to Jewry – modern in every respect. Every language of the world is spoken. At the picture theatres most of the spoken parts are in English but the words are set up along the sides and at the top and bottom in Hebrew, French, German and Greek. To anyone with the means to pay the service is excellent – better I think than anything in Australia and they’ve got a way of getting the cash too – outside the cafes posters tell what they have to offer. The first time I went there I decided on a steak and eggs at 210 mils. I gave the order and the waitress said will you have some bread and butter – yes, coffee – yes. The steak and eggs were good but very more-ish and the coffee was lovely so I ordered another cup. Then at the waitress’ suggestion, some apple pie & cream which was also very nice. Then she gave me the bill – 429 mils. The coffee had cost twenty five a cup, the bread & butter thirty and the apple pie & cream 139. 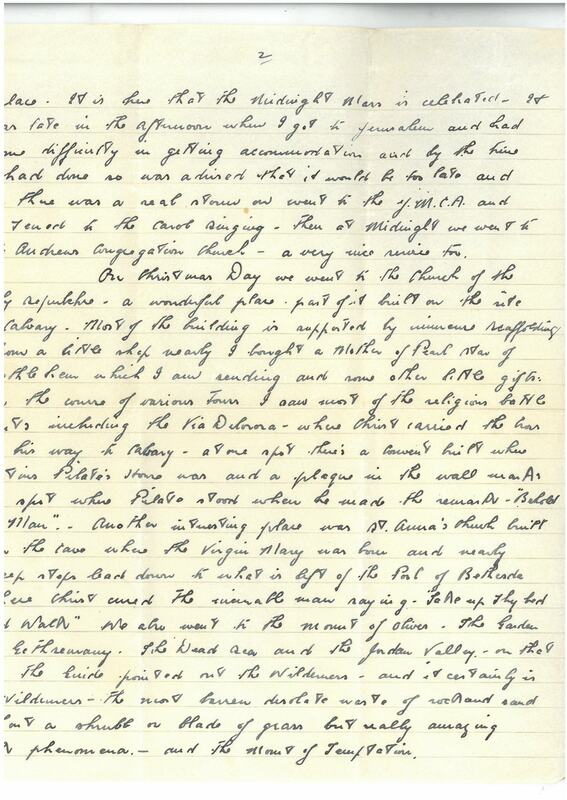 429 mils is 10/9 Australian – not bad on a dollar a day eh? Another example of how they get the cash was when I went to a barber’s shop for a shave. The barber themselves were men but there were quite a number of girls doing manicures, face massage and that sort of thing and each had a queue of our fellows lined up waiting . No wonder they think we’re suckers – ‘just the touch of a woman’s hand’ and everything else of course is on the same lines. Just had a very interesting diversion. Ted Fleming (the postman) came up to tell me there were two parcels for me. Talk about bringing Christmas over well. 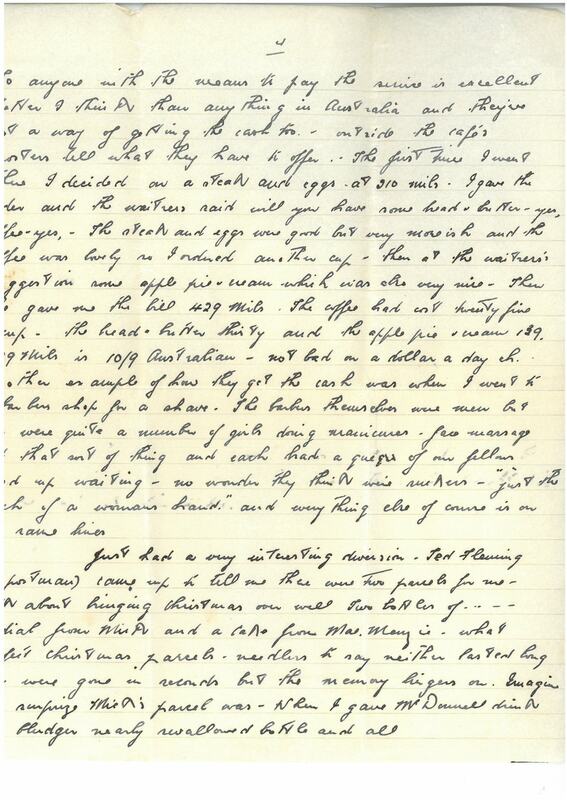 Two bottles of ……cordial from Mick and a cake from Mae Menzie – what perfect Christmas parcels. Needless to say neither lasted long. They were gone in seconds, but the memory lingers on. Imagine the surprise Mick’s parcel was – when I gave McDonnell a drink the bludger nearly swallowed bottle and all. On Christmas night we went to a Services Club show in Tel-Aviv. Had tea cakes, biscuits and wine followed by a sing-song and a dance. There were quite a lot of girls there and they sang and danced with us – quite a happy crowd. Jewish girls are very reserved and don’t mix much with the troops but I believe at the service club shows they’ll always be good company. Well Mother & Dad I guess I’d better sign off as I’ve quite a lot of letters to write. Cheerio and all the very best. 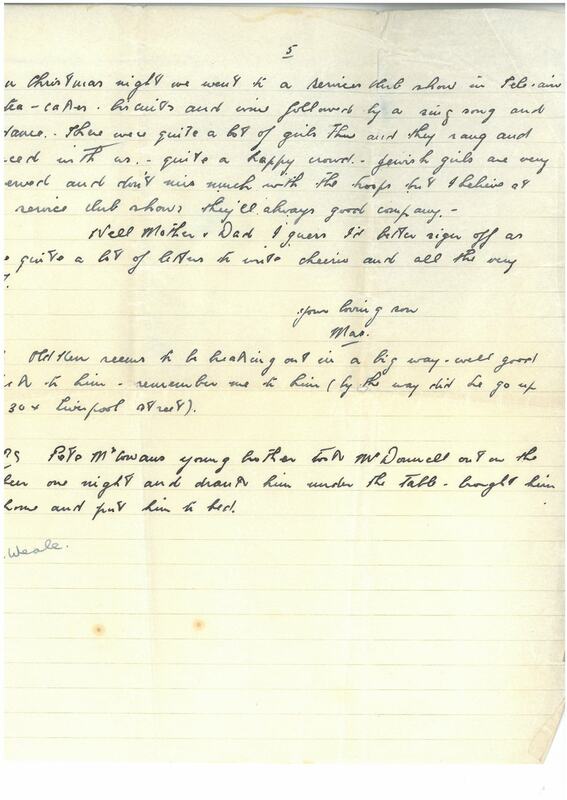 PPS Pete McCowan’s young brother took McDonnell out on the beer one night and drank him under the table, brought him home and put him to bed. 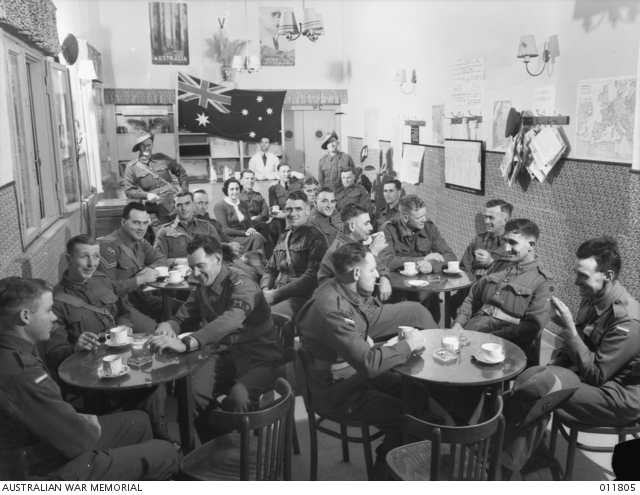 Australian Comforts Fund tea rooms in Tel Aviv. Volunteers provided free tea and cake/ biscuits. The Comforts Fund Hostel in Jerusalem wasn’t open until after Dad’s leave – but presumably all hostels were similarly equipped. from Wikipedia – When the building opened on April 18, 1933, the event was attended by YMCA leaders from around the world. Every detail of the building, with its elegant arches, domes and tower, was described in the world press, which hailed it as a wellspring of cultural, athletic, social and intellectual life. The building is now a hotel. The tower Dad mentions is still prominent. 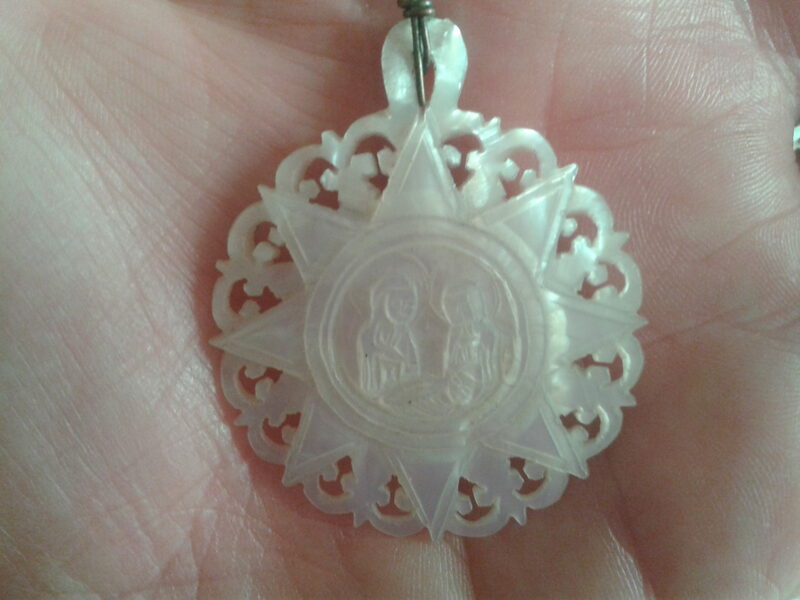 Although the mother of pearl pendant is clearly not a Star of David, I think it must be the gift referred to here, as it has the word ‘Bethlehem’ inscribed on the back, and the image is clearly of the holy family. 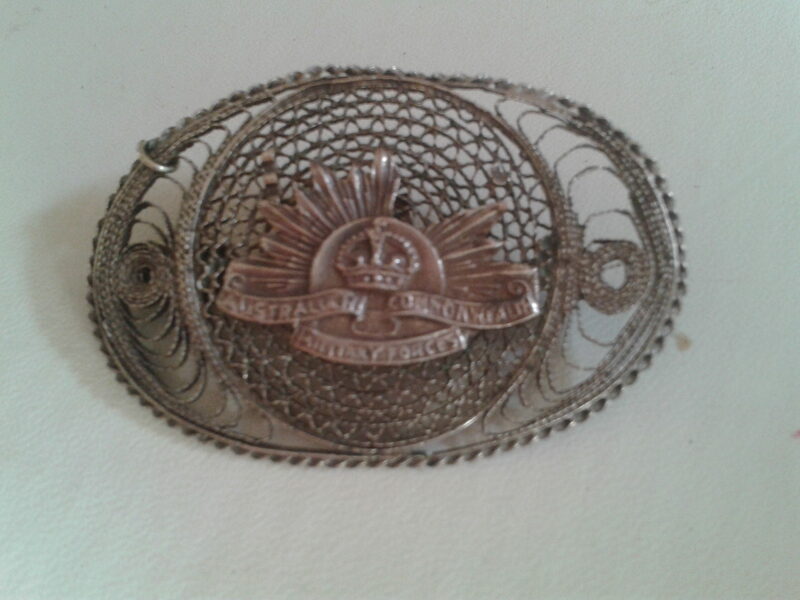 The silver brooch is described by the AWM as a ‘sweetheart brooch’ but as it was kept with Dad’s letters I assume he sent it to his mother. A dollar a day !? Since Australia only moved from stirling to decimal currency in 1966, he was a presumably referring to the American dollar which was worth about 5/- stirling or 6/- Australian at the time. Maybe then, as now, the US dollar was the ‘world currency’. 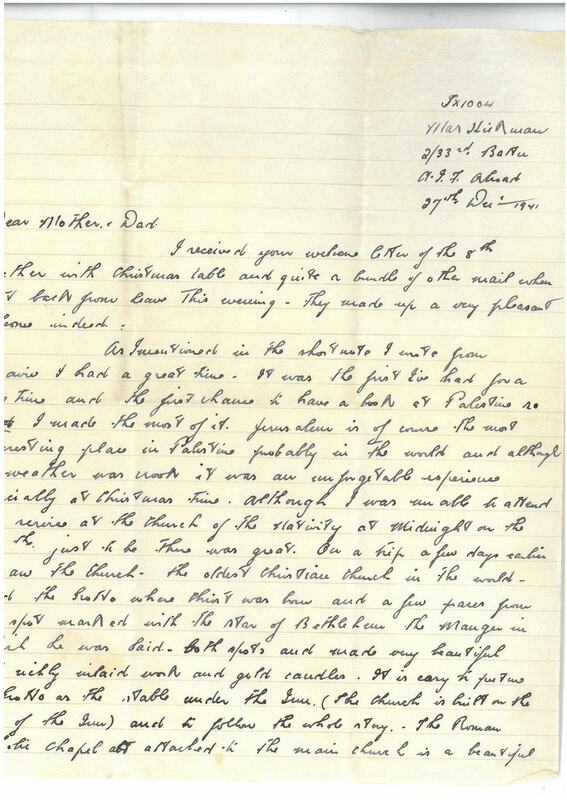 I think as a corporal he was on more like 9/- a day, but even so, more than one day’s pay for the meal described, seems very expensive. 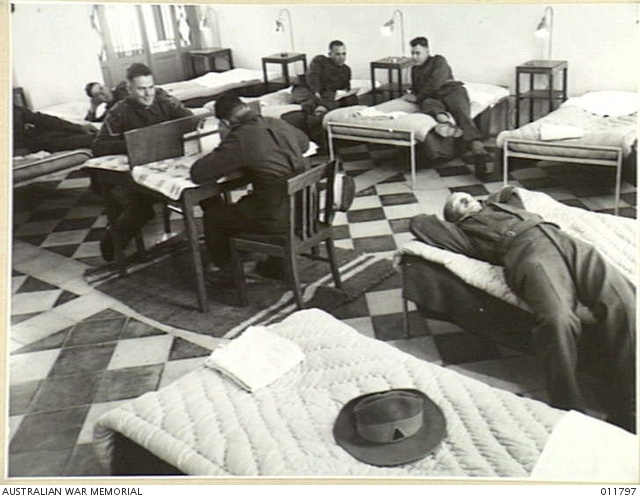 I note that Routine Orders of 2 Dec 41 (AWM52/8/3/33) advise that: All personnel proceeding on (7 day) leave must have 10 pounds Australian in cash or in their daybooks. This entry was posted in Food and Drink, Geography and Culture, leave, Middle East, parcels, pay and conditions, Uncategorized and tagged Christmas, food costs, gifts, Jerusalem, Jim McDonnell. Bookmark the permalink.